Take the work out of skiing. The Vice has an external webbing strap that reinforces your grip on the handle by transferring the pull completely into your wrist. 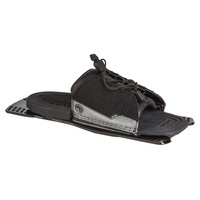 The strap allows you to relax your hands, conserving forearm strength for easier starts and longer ski rides. Some say they’re best if you’re underpowered, but our pro team also raves about the performance. We say they’re both right! KEY FEATURES: · External Grip Dowel - Lock in your grip on the handle and relieve the pressure from your hands. · Inside Out Construction - Look to the left. This is the best thing to happen to your gloves since someone thought to wear them. · Double Thread Gauge - Thicker thread means better longer lasting seams. · Neoprene Stretch Zone - There are good places to have stretch in your glove and places you want it to have more resiliency. We put neo only in the zones you need to flex. · Amara Palm - This traditional glove palm material was originally developed as synthetic leather. Amara is a nylon/polyurethane blend known for its toughness and palm protection. · Pre-Curved Fingers - There’s no reason for your hand to ever be open flat, so why would your gloves fi t like that? Our pre-curved designs are magically formed to a skier’s hand position. Sorry. We just can’t tell you how it’s done.